Taichung definitely has better weather than Taipei right now with its clear blue skies and warmer temperatures! 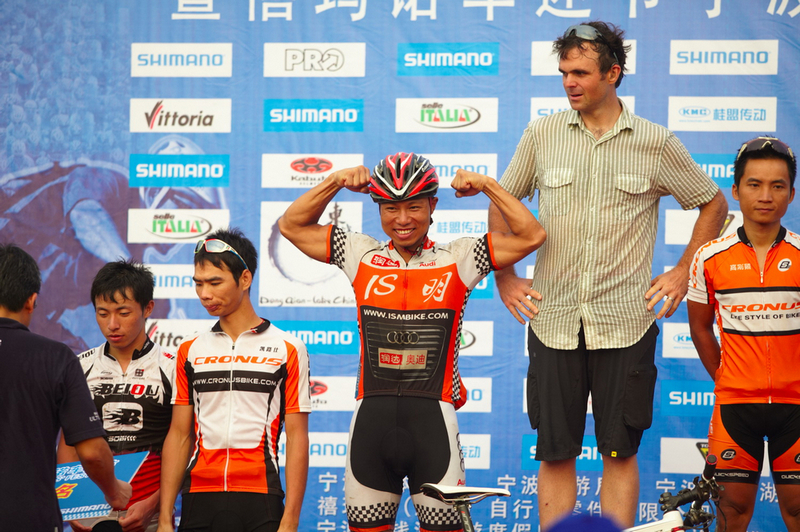 I met with Colon Lai from Champion System Taiwan and he showed me the National Taiwan Championships circuit. It was a nice circuit, 10km with a punchy 5-6 minute climb. The road was super-smooth and goes through the Taichung Science Park. The Taichung Science Park circuit is quite popular with riders coming out to practice on. Feng Chun Kai – the national champion from Team Exustar was the clear winner at the Taiwan National Champs late in 2009. I did one “hot” lap of the course, 42km/h average and 20km/h average up the climb. Colon had enough of riding and took me to a cool place to eat breakfast at a cafe where you can take your bikes inside. Breakfast consisted of a delicious tasting black sesame bread roll filled with german sausages and fresh vegetables. Some small brownie style cakes came on the plate and were good with the Latte I had. After riding with Colon for most of the morning, I continued exploring Taichung on my own. I found myself in the mountains fringing the outskirts of the city – where the Da Keng Park is located in. I found some really nice narrow mountain roads without any traffic and spent the afternoon riding up and down the small mountains that ranged from 250 to 500m in height. There were other much bigger mountains in the distance, however I did not have time to do those as I needed to be back in the city to meet my wife who was doing a commercial shoot. 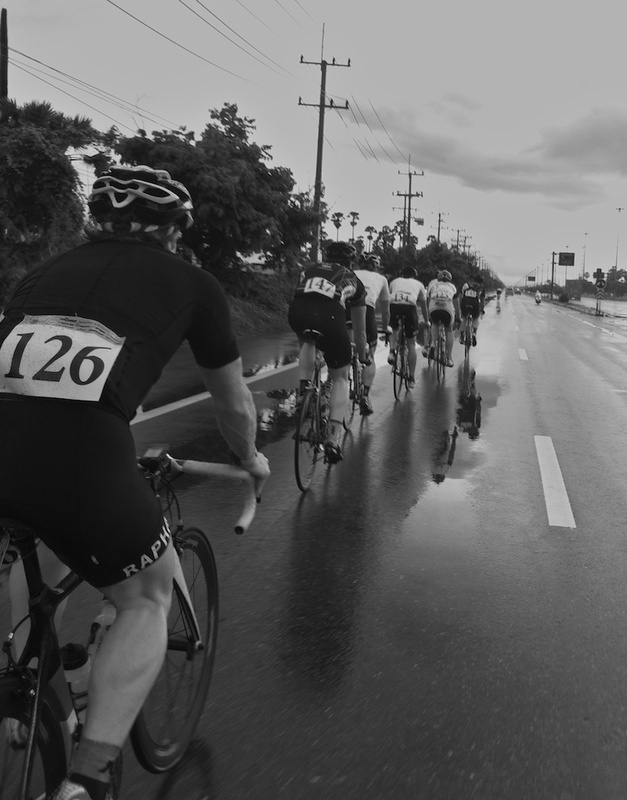 I clocked up 150kms of riding in Taichung and got a taste of what riding is like. It definitely lives up to the fact that it is sunny 330 days of the year and seldom rains. Makes for even better riding than in Taipei since you don’t have to clean your bike every couple of days! Bikerdan, this is Bikermom (my blog name). I lived in Taichung for over 4 years. We just moved to Ho Chi Minh City (though came back for Giant Cup and Stage 7). CCK Loop (around Taichung Airport) – 20km, no lights and you can HAUL. Flying Cow Ranch Get to Tai 1, go north until TongSiao. Turn right just before the tunnel (huge brown sign posted), Ranch is about 8km off that road. You need to make a left turn, but if you miss the sign, you have bigger problems. To come back, we often cross in TongSiao and go on the 61 expressway. There are very FEW lights. 136 ? ?- TaiPing – you may have stumbled upon this during your DaKeng explorations. I took WenShin to 129, then 129 intersects 136. Most of the local riders have a "136 time". Start from the Hi Life, and its a 600m climb over the last 8km. stop at the rock (when you get there you'll know), about 13km. DaShueShan ??? get on Tai 8. Its a LOVELY CLIMB! 15km to Police Station, 26.5km to tunnel, 35km to park entrance, 50km to top. So jealous! The loop you did, we called that "gold dome hill" and I lived only 2km from that. I trained that hill many, many times! Finally, should you find yourself in the area again, I have an excel spreadsheet of all the gradients, etc of hills on the DaDu mountain area (ridge that seperates Taichung from the oceanside).